About.com has reviewed a waterproof camera from Fujifilm. 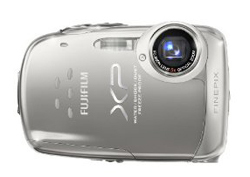 The digital camera is called Fujifilm FinePix XP10 and is able to take pictures down to depths of 3 meters. The Fujifilm camera is able to handle shocks and cold temperatures. About.com ends up giving the Fujifilm FinePix XP10 camera a very good review with an overall score of 4.5 stars out of 5 possible. On the positive side the reviewer thinks the camera from Fujifilm have a good look, the price tag is nice, the rugged features are useful and the camera is easy to use. There are a couple of negative points such as hard to see the content on the LCD screen in bright sunlight, shutter lag when taking indoor photos and too small buttons. Overall the XP10 seems like a good rugged camera if you are not interested in spending a lot of money. Read the full review of the Fujifilm FinePix XP10 digital camera here.